Renowned multi-cultural dance troupe Pacifíco Dance Companywill present its unique blend of traditional and contemporary Mexican dance and folklore in an entertaining and educational family performance at Pepperdine University's Smothers Theatre in Malibu on Sunday, April 14, at 2 PM. Pacifíco will be presenting a new program entitled Al Paso de la Mujer, which explores Mexico's past through the eyes of La Mujer Mexicana (The Mexican woman). 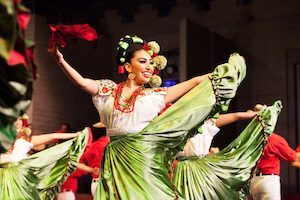 This very special performance is dedicated to the women of Mexico for their beauty, strength, and compelling courage that helped shape the Mexico we know today. The piece Mujeres de mi Tierra takes inspiration from the female warriors of the Mexican Revolution and uses theatrical elements including prop weaponry and gunfire sound effects. Since its founding in 1992 as a nonprofit organization dedicated to the preservation and reconstruction of classical and contemporary Mexican dance forms, the Los Angeles-based Pacifíco Dance Company has been bringing its vital blend of Mexican history, professional standards, and sense of pride to both national and international audiences. Under the guidance of founder, artistic director, and choreographer Adriana Astorga-Gainey, the company has continued to thrill audiences with its unique blend of modern and traditional dance, and has evolved and created its own unique style, costume designs, music, and choreography. With some 40 dancers and musicians, Pacifíco highlights the colorful history, rich traditions, and a diverse population of Mexico by seamlessly weaving together elements of modern dance, ballet, and native dances of Mexico. The group also incorporates Mexican folklore, religion, and current themes to further the appreciation and understanding of present-day Mexico. The company is passionately committed to encouraging cultural pride within the Mexican-American community, as well as developing an understanding, appreciation, and acceptance of ethnic diversity within the greater Los Angeles region. Pacifíco has held several sold-out performances at the John Anson Ford Amphitheatre and has performed at many major venues in California, including the Carpenter Center, the Cerritos Performing Arts Center, the Redlands Bowl, the Dorothy Chandler Pavilion, the Luckman Fine Arts Complex, The Getty Center, and the Universal Amphitheatre. For six consecutive years the company performed at the prestigious Dance Kaleidoscope Summer Dance Festival in Los Angeles. The group has collaborated with several well-known musicians, including Mariachi Sol de Mexico de Jose Hernandez, Pablo Montero, Conjunto Jardin, and Pepe Aguilar for live performances. The company has also performed at many venues throughout the southwestern United States, including Arizona, New Mexico, Nevada, and Utah. Pacifíco was also honored to perform in residence at the world-famous Kennedy Center in 2007. In 2001 Pacifíco, along with Mariachi Sol de Mexico, made a historic visit to North Korea and the People’s Republic of China as part of a cultural arts exchange. Pacifíco has twice been recognized as part of the Irvine DanceMaker awards. Throughout its 20-year history, Pacifíco has put much emphasis on collaborations with educational organizations to produce performances for K–12 students. This initiative intends to build audiences by engaging students in the arts. For two years, the company was in residence at the Los Angeles County High School for the Arts where it taught Mexican Folk Dancing and rehearsed. The company has been prominently featured in a number of publications and TV spots, both locally and nationally, including the L.A. Times, the Oregon Mail Tribune, the Delaware News Journal, Hispanic Magazine, and the Spanish-language daily La Opinión. Pacífico has been profiled by KCET-TV’s award-winning program Life & Timesand the nationally syndicated show American Latino TV, broadcast to over 50 million homes across America. A native-born Californian, Adriana Astorga-Gaieney began her dance training at a young age. Her introduction to Mexican folklore was at the Escuela del Ballet Folklorico, under the direction of Amalia Hernandez. She trained at la Escuela de Danza, Mizoc and with the legendary Rafael Zamarripa Casteneda, and studied classical ballet with master dance instructors Don Hewitt and Joanna DIgiovanna. Throughout her dance career, Astorga-Gaieney had the privilege of working with Don Bondi, former lead dancer of the Gloria Newman Dance Theater, Davinci Burks, former Alvin Ailey soloist, modern dance master Rudy Perez, and most recently modern dance teacher and choreographer Karen Mcdonald and ballet master Stephan Wenta. Astorga-Gaieney is the proud recipient of the 2003 and 2005 California dance maker grant and has been awarded certificates of recognition from both the city of Los Angeles and the Mexican Cultural Institute for her immense contributions to the folkloric dance form and the Mexican American community. Ticket prices range between $10 and $40. For additional information about the performance, visit the Center for the Arts website.